At noon, a speck of sunlight is piercing the hazy sky that has become symbolic of the Delhi winter. An angular façade, intrinsic part of the city’s architectural highlights, hard to miss for years, is difficult to spot today from a distance. 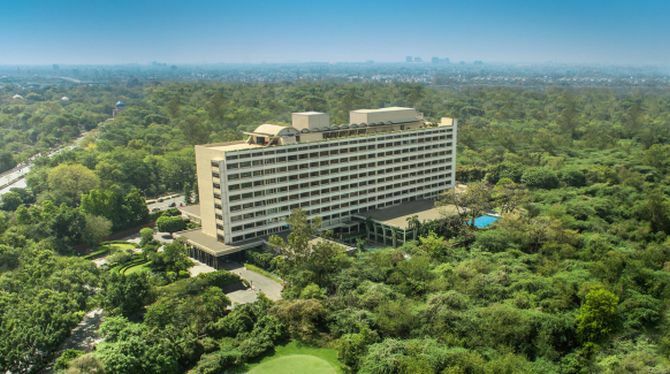 After a revamp hiatus of 21 months, The Oberoi is calling to its patrons again. The cold, crisp air, filled with nostalgia around the carefully placed five-star property, makes for an inviting visit. A short uphill drive inside the tucked-away entrance leads to the first of its many technological overhauls. The barricades, the boom barriers and men with under-vehicle search mirrors have been replaced by automatic rising bollards, underground image scanners and overhead cameras. The gadgets allow a privacy-intact welcome that, in contrast, gets more interpersonal. The lone guard’s only job now is to welcome the guests with folded hands. The foyer is where the Rs 6-billion refurbishing cost starts to subtly speak out. The few early guests walk on pristine, chequered floors made from Greek Thasos marble, while the neatly dressed staff tiptoes in full strength. The interiors are completely redone with new ceilings, custom-made lighting and exquisite furniture. For the people who have been a part of the prestigious Belvedere Club, the two-level members’ sanctuary is maintained in adherence to executive chairman P R S Oberoi’s design philosophy: High ceilings and large windows optimally utilising the natural light and the space. A new cigar lounge with leather sofas and an exquisite collection of Cuban cigars is adjacent. The man for the job, internationally renowned designer Adam Tihany, working under the guidance of the chairman himself, has introduced many design elements that replace or improve the overall aesthetics of lobby interiors. From the lit fronts of the concierge desks to floor layouts and myriad teakwood and oak furniture designs, the patterns are inspired by Edward Lutyens’ style of interiors. A mesh of interlocked cells embellished with blue, yellow and white seashells form a screen for guests checking in and out, separating the concierge desks from the rest of the lobby. The walls encompassing the ground floor have familiar artwork, denoting the lives and times of Indians in different parts of the country and the occasional nizams of the Mughal era. Unchanged, however, is The Oberoi signature golden ‘Tree of Life’ that still stands in the lobby where it has been since the hotel came up in 1965. Earlier, the huge windows to the right gave a view of the outdoor swimming pool. The pool has now been replaced with a show-only water body that glitters with mashals in the evenings. For guests keen to swim, there are two - indoor and outdoor - temperature-controlled pool. The façade of the building, however, has not been compromised with. Neither has the surrounding view. Still visible from the rooftop are Delhi Golf Club on one side and the UNESCO World Heritage Site of Humayun’s Tomb on the other. The emphasis of change has been on the food and beverages on offer. Among the new is Cirrus9, a rooftop bar with automatic wind sensors to protect guests from the breeze, sun and rain. Cirrus9 shares the top floor with a minimalist in design, indoor Chinese restaurant Baoshuan, mentored by Michelin star chef Andrew Wong. Named after a treasure-ship of the Ming dynasty, Baoshuan curates cuisines from about 40 districts in China. Another newly-crafted wine and dine space is the Indian restaurant, Omya, led by Michelin star, London-based chef Alfred Prasad. The intimate space with impeccable white and gold cutlery and bold colour schemes boasts of Indian cuisine with an international flair. The old and famous restaurant, Threesixty, gets a new live kitchen and an improved sushi bar. The building has also been fitted with 40 large-capacity air purifiers. The interiors of the room, too, have been completely revamped with refreshing, non-consistent designs and contrasting colour schemes. The number of rooms has been reduced from 283 to 220 - including 34 suites - to offer more open space. From the deluxe room to the presidential ‘Kohinoor’ suite, all rooms now have a walk-in closet and an iPad-powered interface, Oberoi Enhance, to control the in-room gadgets - lights, window blinds and all electronics - and to order room service and book spa appointments. The suits get marble-finished bathtubs with a view and in-mirror televisions. For traditional sensibilities, most of the upholstery fabric and bed linen at The Oberoi are hand-woven in traditional designs. At 2 pm, while the fog only spared a silhouette of Humayun’s Tomb from the rooftop, a few could be spotted at the Delhi Golf Club swinging and potting it right. Standing behind the bar at Cirrus9, Giorgia, among the loyal staffers who were dispersed to other projects and are back, insists on trying out the new cocktails, while slipping in that ‘Manhattan’ remains her old-time favourite. A lot is new at The Oberoi but at its core, the old ethos reigns.